The Eagles and politics: What can the Super Bowl champions teach society? Philadelphia Eagles safety Malcolm Jenkins raises his fist during the national anthem with support from teammate Chris Long. A country is a lot bigger than a football team. It is also a lot more diverse and complicated. But every NFL team has more than 50 randomly selected men working alongside one another, day in and day out, for hours upon hours at a time. Some of these teams rift, don't develop the chemistry needed to succeed or simply lack the talent. Others, like the Super Bowl champion Philadelphia Eagles, have come together in ways the currently divided United States seems unable to. And, ironically, the ruptured politically-charged world that lives just outside the Eagles' tunnel-visioned locker room collided with them this week. "Politics are a huge talking point in this country, especially right now," said Jason Kelce, one of Eagles' veteran leaders. "It seems like our country is more divided than ever. This is something that was expected to happen regardless of how it transpired." "One of the beautiful parts of being in the NFL is you have a melting pot of guys from all over the country. You have guys from rural America, guys from inner city Detroit, you have middle class, upper class, and people who grew in single parent households with nothing. There are all different viewpoints, all different beliefs and everyone puts that aside to compete as a team, to develop sympathy and empathy for one another and to develop the ability work together and to be honest, I think our country could follow that a little bit more." Those quotes came from an NFL locker room after practice during optional team activities. It started a few years ago, when Malcolm Jenkins felt compelled to speak and act out (by raising a fist during the anthem) after Colin Kaepernick's protest against excessive force by police officers and social inequality resulted in him being blacklisted (he still is unemployed). With a few other Eagles speaking out during the Eagles' championship season — like Rodney McLeod, Chris Long and Torrey Smith — Philadelphia became the NFL's "wokest" team in 2017 as they marched to a world championship. With a White House visit — or non-visit, as it turned out — inevitable, the NFL also handed down an unrelated but no less controversial rule change that will fine any activism on the field during the national anthem. With an opportunistic and partisan President tweeting his back into a corner, a reported small contingent of Eagles players were planning to attend and were uninvited by the White House Monday night. "I don’t think it was an anthem issue solely but I don’t want to put words in anyone's mouth," Pro Bowl center Kelce said Wednesday. "Everyone came to their own decision. No one felt pressure, from the team or from other players. … My reason for going or not going had nothing to do with it." "We’ve always been a family," wide receiver Nelson Agholor said. "We always preach it and we live it each day. It’s about us, it's about the Philadelphia Eagles. It's about the guys in the locker room and about our fan base. And we take care of our own." 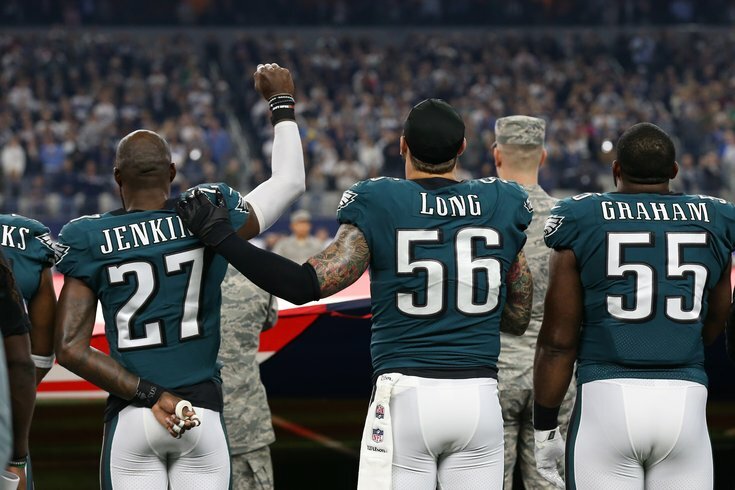 Unlike the pundits on cable news or the arguments on Twitter and in comment sections all across the internet, the Eagles players couldn't care less about one another's political views. They didn't pass judgement based on whether a player wanted to visit the White House — in fact there is likely more fighting amongst players debating on whether LeBron James or Michael Jordan is the greatest of all time. Some players won't say a word on the subject, like Fletcher Cox. And some speak (or hold up signs) until the press is out of questions like Jenkins. All walks of life seem to have a place and representative in the Eagles locker room. And it just so happens to be a locker room adorned with "Super Bowl LII Champions" just outside the entrance. "It's not my job to try and change Malcolm's mind, it's not Malcolm's job to change mind or whoever else," tight end Zach Ertz said. "Malcolm respects everyone in this locker room. I respect everyone in this locker room. Nothing is going to tear this locker room apart." Not since the Eagles first signed Michael Vick nearly a decade ago have so many journalists and cameras descended on the team's locker room availability, one team employee contemplated. And seemingly more media than Super Bowl week were present in the wake of the White House controversy Wednesday. But the players practiced hard, and answered questions with poise, understanding and patience — showing a true willingness to further the idea that togetherness is the solution to the country's woes, not continued partisanism. "If I looked at politics in general right now, I think the country as a whole is very divided," Kelce, who made sure to point out that he is not a politician (and may have been a cast member on It's Always Sunny in Philadelphia), said. "If you look at past years, especially in the United States you'd see a much more moderate political viewpoint across the country and you'd see at least the ability of Republicans and Democrats to see other people's viewpoints. I think right now that's probably lacking nationwide. There are very polarizing topics and people have very divided beliefs on that." It's been nearly 150 years since the first championship team was invited to the White House, and in the past two years both the Warriors and the Eagles were uninvited from the White House (expect a repeat when the Warriors or Cavaliers win the NBA title this month). It is unclear how long this political mess and intersection of sports and politics will continue, but you can bet as the season gets closer, you'll hear a lot less on the off-field nonsense and more football talk. "I don’t know anything about that," Agholor said, when asked if he thinks the team was trying to pull off a political stunt this week, "but do we look like we want attention? We are trying to play football." Sports has, in the past countless times, shown it can bring people together and heal. It's as good a time as any for it to happen again.